Product prices and availability are accurate as of 2019-04-07 10:16:57 EDT and are subject to change. Any price and availability information displayed on http://www.amazon.com/ at the time of purchase will apply to the purchase of this product. 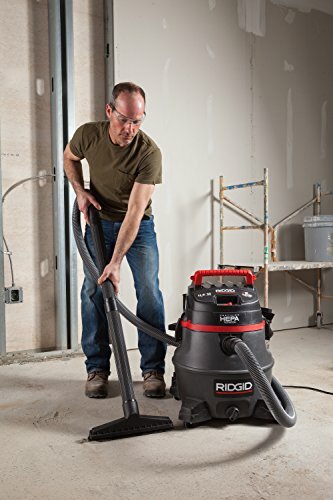 This RIDGID RV2400HF Wet Dry Vacuum with Certified HEPA filtration delivers heavy-duty performance for tough cleanups. 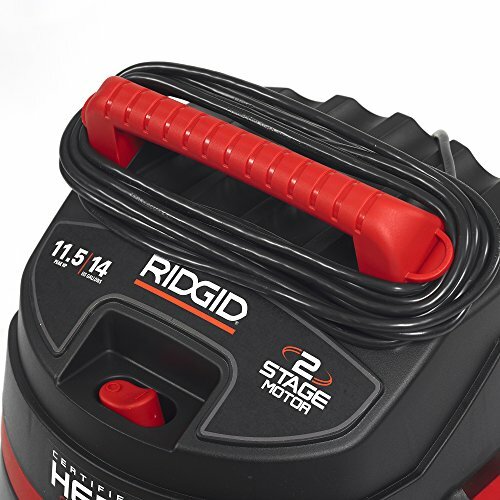 The 2-stage, 11.5-amp motor with patented Scroll Noise Reduction technology creates powerful high-lift suction and efficient airflow for quieter operation and superior performance. 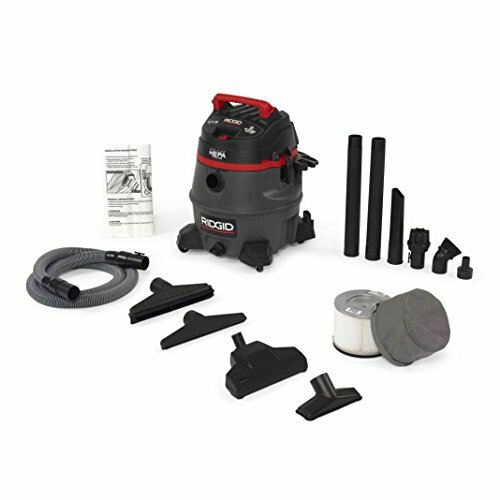 The shop vacuum offers 3 stages of filtration from collecting larger debris, capturing small particles, to capturing 99.7% of microscopic particles. The HEPA filter meets the EPA’s definition under the RRP rule for lead paint renovations. The 1-7/8-inch by 10-foot locking hose won't pull loose while in use, ensuring consistent and optimized air flow. 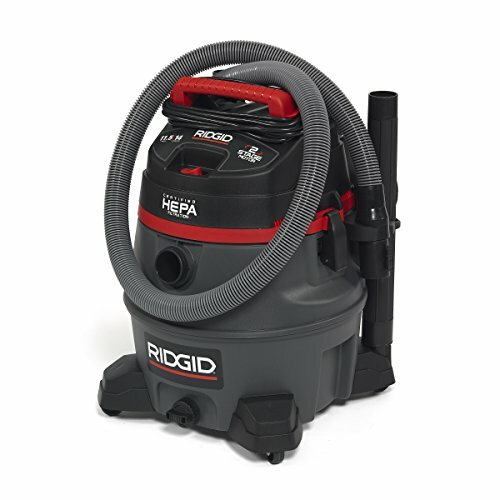 It can also lock into the blower port for removing leaves and debris from walkways, decks or job sites. A large drain on the polypropylene drum lets you easily empty liquids, and the patented Qwik Lock Filter Fastening System allows easy filter installation and removal without the need for fasteners or tools. 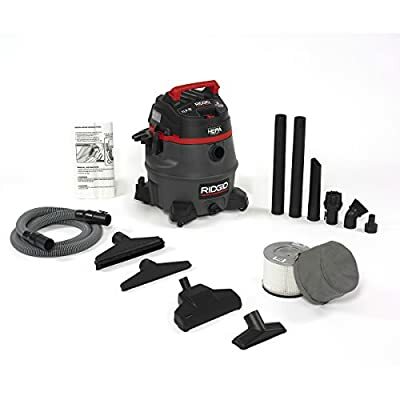 The wet dry vacuum cleaner comes complete with HEPA filter, filter bag (model VF3502), two 2-1/2-inch wands, a utility nozzle, a floor brush, a wet nozzle, a crevice tool, a dusting brush, a turbo nozzle and a diffuser. RIDGID covers its products with a lifetime warranty against defects in material or workmanship for the life of the tool. Since 1923, RIDGID has remained the symbol of certainty to dedicated professionals of the expert trades. Every tool that bears the RIDGID brand is engineered to the same high standards of quality, strength and endurance, as was that first heavy-duty pipe wrench more than 80 years ago.